Humans are hard-wired for visual learning. Every mark we make as a graphic facilitator is designed to increase engagement and understanding for your audience. During live meetings and conferences, we capture your big ideas and visualize complex concepts to help people make better decisions. at your next meeting or conference? Alphachimp travels to India as part of an international team of graphic facilitators for the 2017 Vibrant Gujurat Summit. For TEDMED 2017, we created a giant chalk wall while the American Medical Association hosts “fireside chats” on the promise, the benefits, and the challenges of digital health. At the 2016 a2ru conference, Alphachimp captured ideas and innovations for two distinct areas of interest: Arts Entrepreneurship and Arts in Health. 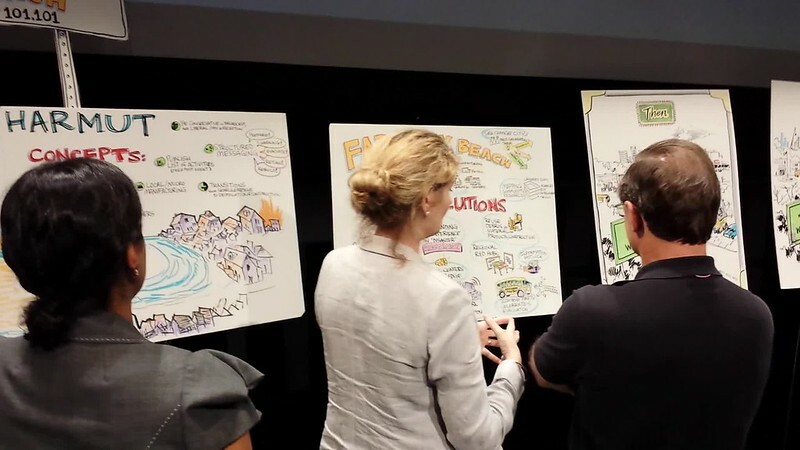 Graphic Facilitation is the practice of using words and images during live events. Creates a conceptual map of a conversation. Connects data and information to emotion. Visualizes complex or abstract concepts. Since it's founding in 1998, Alphachimp has provided this service for hundreds of intimate brainstorming sessions and high-profile conferences for Facebook, Google, TEDx, TEDMED, Ciudad de las Ideas, and PopTech. Keller GB, et al (2012). Sensorimotor Mismatch Signals in Primary Visual Cortex of the Behaving Mouse. Neuron. Often times, traditional presentations do not fully use our capacities for cognition, imagination, and action. 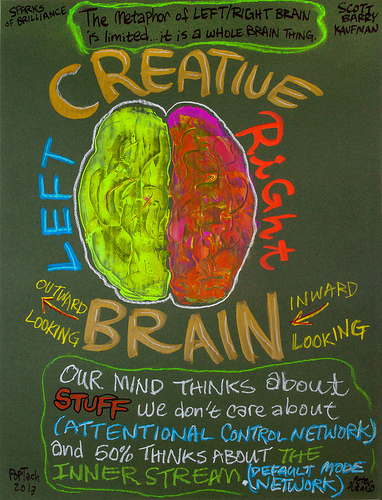 Research suggests that up to 60% of our brains are hard-wired to be visual learners. Depending on the stage of the creative process — and what you’re actually attempting to create — different brain regions are recruited to handle the task. Experiential learning is a “whole brain” activity. There is no Left-Brain/Right-Brain personality. Instead, researchers now find that the function of any cognitive brain network ultimately depends on its multidimensional aspects. The Executive Attention Network for tasks requiring that the spotlight of attention is focused like a laser beam. The Imagination Network for constructing dynamic mental simulations based on personal past experiences to create alternative perspectives and scenarios. The Salience Network for monitoring both external events and the internal stream of consciousness. By providing stimulating visuals, relevant storytelling, and large-scale objects, Graphic Facilitation creates an environment for your audience to connect to content — and each other. So... how might we be of service? Teach me (or my team) how to be a rockstar scribe!